Today we can examine the work of one monk, Eadrith (later the Bishop of Lindisfarne), who produced a stunning example of book painting that is even older than the Diamond Sutra. Folio 27r of the Lindisfarne Gospels. Depicted here is the beginning of the Gospel of Matthew. Image online, courtesy Wikimedia Commons. 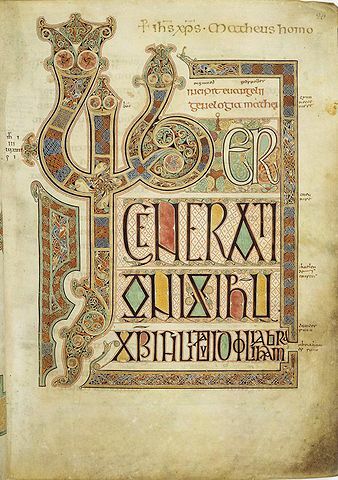 Although the manuscript is undated, The Lindisfarne Gospels were likely copied and illustrated by Eadrith while he was still a monk at Lindisfarne Priory, on Holy Island (off the English Northumberland coast). Nothing remains of the original monastery. Since Eadrith became Bishop in 698 AD - the date scholars typically use for the manuscript - St. Bilfrid bound the manuscript and added precious gems and metalwork to its binding. Currently owned by the British Library, the Lindisfarne Gospels contain notes from a priest, Aldred, who also inserted a word-for-word Anglo-Saxon translation in the spaces between the lines of Latin text. Those insertions were probably made between 950 and 970 AD. In the meantime, the monks had fled looting Vikings who, according to the Anglo-Saxon Chronicle, invaded the area (be sure to activate "fly" to "view" this virtual-tour animation) during January of 793. The monks took with them their most important treasures: the Cross of St. Cuthbert (which was made on Holy Island) and their "books" (the Lindisfarne Gospels). The Gospels had no ordinary journey on that trip. While fleeing the Viking invaders, the monks - and their books - were shipwrecked in the Irish Sea. Later, the foot-high Lindisfarne Gospels washed ashore and were taken to Durham where monks continued to produce other precious manuscripts. Bos, Carole "THE LINDISFARNE GOSPELS" AwesomeStories.com. Aug 01, 2000. Apr 24, 2019.